A porch gives you a place to watch the rain, visit with friends, or read a good book. A well decorated porch adds curb appeal and value, and it can even help define your home's architectural style! Some houses have such a distinct style they almost demand their porch follow suit. 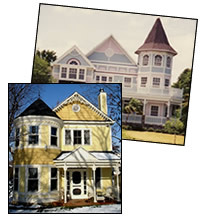 For example, if you have a 2-story Queen Anne Victorian with a turret, you need lots of intricate gingerbread trim to complete the look. It wouldn't be advisable to put Craftsman-style details on a traditional Victorian. 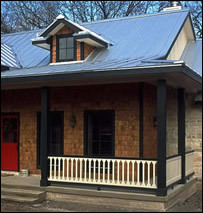 Instead, use the porch and other exterior architectural details to reinforce the existing style. It's spring! Some of the country is still blanketed with snow, but soon the tulips will bloom & warm weather will send us outdoors. In Texas, it's already warm, so I've been enjoying evenings on the porch. The baby chicks I mentioned last March are now full-grown chickens I enjoy watching while catching the sunset from my porch. My next project is to get my salvaged porch swing painted for even more relaxing this spring! Here at Vintage, we are not only greeting the warmer weather and budding trees... we are also welcoming 5 new staff members aboard. We are excited about the months ahead, and we're ready to help you create your dream porch (or finish up your winter projects)! I wish you each a very happy spring! At 660 feet, Grand Hotel's front porch is the world's longest, and is visible as you approach this Michigan island from the Straits of Mackinac. Isn't it magnificent at night? Click the photos for larger views! 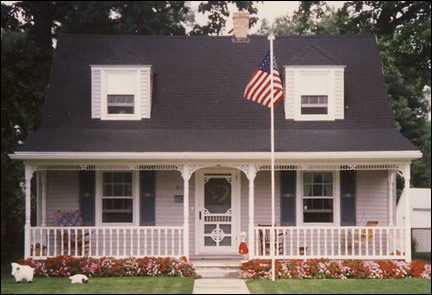 AFTER: The new porch with basic Gingerbread (including our Jenny Lind Spandrels & Arch Brackets), Screen Door, flowers, and yard decor all work together to convey a charming country style. 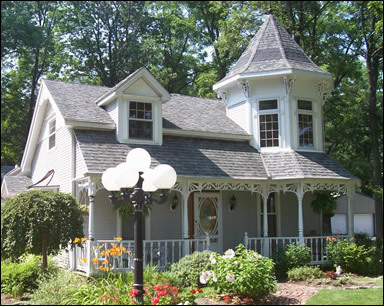 This similar house took another direction with a tower, more ornate and substantial Spandrels and Porch Brackets, plus Corbels under the tower eave to give this cottage its Victorian flair. Here's another house with the same basic shape, but the Square Porch Posts, simple Sawn Balusters, and Cedar Shingle siding create an inviting Shaker style home. 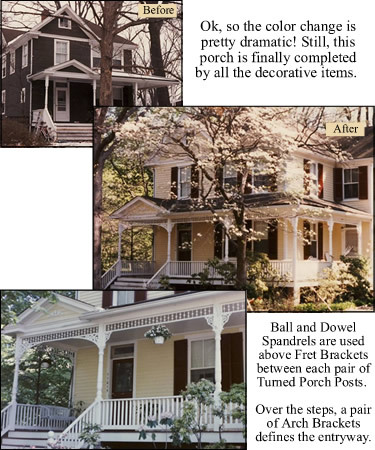 So, what does your porch need to reinforce or define your home's style? 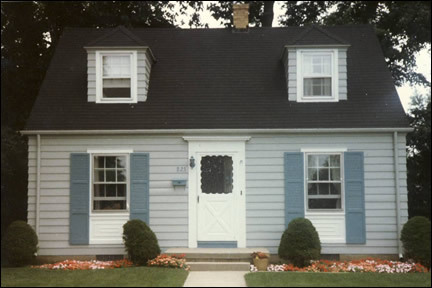 Not sure where to start or what style house you have? Contact us for Free Consultation! "Like" us on Facebook! After you do, please send us a Facebook message, and we'll reply with a Coupon Code for $10 off your next order. You can browse previous newsletter editions and read other readers' feedback at our website. If we can be of further assistance, please let us know. We'd love to help with your projects in any way we can.